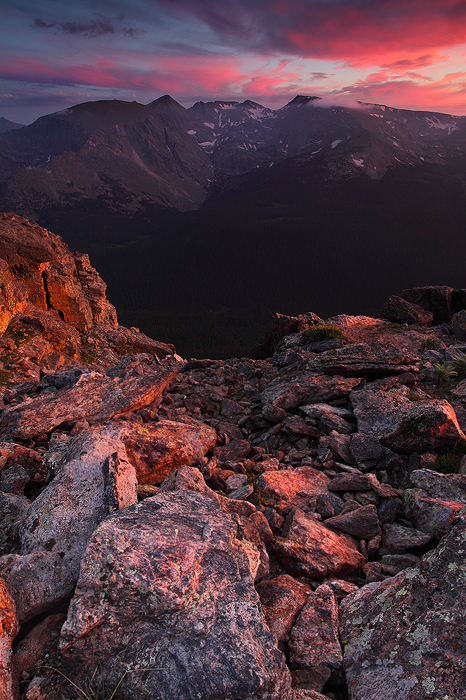 Looking from the Rock Cut area of Trail Ridge Road, past Forest Canyon and towards some of Rocky Mountain National Park's most recognizable mountains, an amazing display of sunset light lingers in the Colorado sky. Starting from left to right, Terra Tomah Mountain, Mount Julian, Cracktop Mountain, Chief Cheley Peak and Mount Ida can all be seen. These mountains surround the spectacular Gorge Lakes Basin, a dramatic area with numerous high alpine lakes, some of which can be seen in this photo. This was a rare sunset. The kind photographers dream of. This image was made well after the sun had set behind the Never Summer Mountains, but indirect light reflecting off the clouds overhead was intense enough that it was creating its own light that you can see cast on the foreground rocks.